A husband and wife living on Universal Credit as their six-year-old son battles a life-threatening brain tumour say they are sometimes force to eat his leftover hospital food. Rachel and Chris Nelson both quit their freelance jobs when their son Blaise was diagnosed so they could care for him. The Manchester family, including four-year-old daughter Asha, are living on just £552 a month through Universal Credit, or less than £130 a week. They're in such dire financial straits they sometimes eat Blaise's uneaten hospital food, the parents told the Manchester Evening News. Chris, who worked in schools to promote arts, said: “You just can’t live on this money." The benefit is awarded to the family, who rent their house in East Didsbury, to help them pay for everyday items such as food, drink, bills and rent. Rachel also receives a Carer’s Allowance of £64.60 a week, which is used for anything bought while in hospital and to run a mobility car to take Blaise to and from scheduled appointments and emergency hospital visits. The couple say they are struggling to make ends meet on Universal Credit after being plunged into sudden crisis just eight months ago. Rachel, who worked with young people with learning difficulties, said: “When we are very skint, we will eat the hospital food that Blaise won’t eat. When Blaise started to feel unwell last October, worried Rachel and Chris took him to A&E and GP appointments to find out what was wrong. The schoolboy was suffering with headaches, insomnia and a change in personality. Initially, doctors didn’t know what was causing Blaise’s symptoms, until Rachel spotted a lump on his head. Medics eventually discovered that a "satsuma-sized growth", was causing pressure to Blaise’s cerebellum. He was diagnosed with a rare brain cancer and underwent surgery followed by 12 weeks of gruelling chemotherapy and 25 sessions of intense radiotherapy over the summer. Experts are now working to decide how best to treat Blaise now that the cancer has spread to his spine. 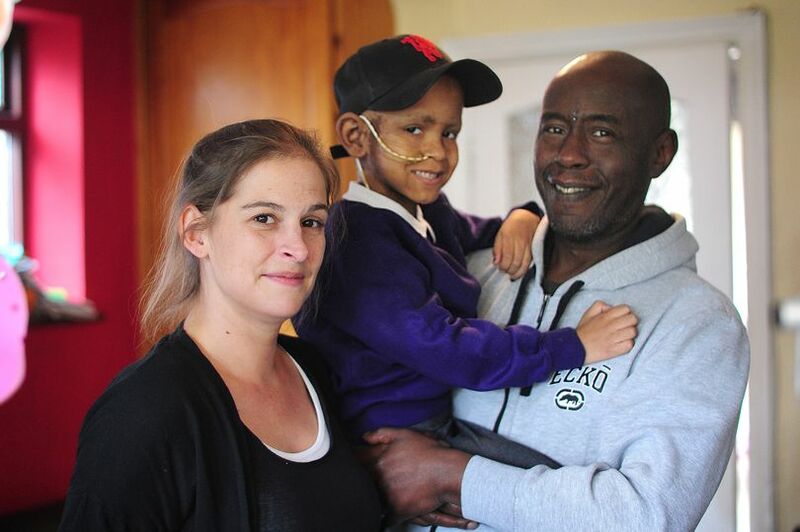 Blaise’s parents are determined to do all they can to make their son’s life easier while he battles cancer - which is why they both quit their jobs to stay at home to care for him. When they initially stopped working, both Rachel and Chris applied for the new style Employment and Support Allowance (ESA) - money you get if you cannot work because of illness or disability. But both were told they were ineligible and should instead apply for Universal Credit. Rachel said: “We don’t tick the write boxes for that benefit because we’re not sick. “At the beginning we kicked up a fuss and said we needed some money. They said the maximum they could pay was £1,200. But because they had done that, they then took £100 off us each month to pay it back. “I now get Carer’s Allowance too, but it affects the amount of Universal Credit we get. “The care component of Carer’s Allowance is offset by hospital costs. It can cost a lot of money in hospital, and we need to eat. The family also has a small amount taken from their benefits each month for unpaid council tax. Chris said the benefits system has caused the family added stress during Blaise’s illness. He added: “His condition is critical - it’s life threatening. It’s too much for one parent to manage alone. “Our case worker at the job centre has been really helpful but there’s only a certain amount he can do. The system is just not set up for people in our situation. “For self employed people it’s a real catch - it doesn’t leave you with much at all. “The debts are just building up at the moment which we’re just trying to manage. There’s nothing for emergencies if something were to happen to the house. “We are lucky we have good friends. The Department of Work and Pensions has been approached for comment. Universal Credit is paid monthly, or twice a month for some people in Scotland, to help with living costs. People may be eligible if they are on a low income or out of work. But whether they can claim it depends on where they live and their circumstances. For those already on benefits, Universal Credit replaces benefits such as the child tax credit, housing benefit and income support. People who receive any of those benefits cannot claim Universal Credit at the same time. It is being introduced in stages across the UK, but it has been heavily criticised by support organisations and Labour, who have called for it to be scrapped entirely. Opponents say it leaves claimants worse off.